A first man in a black robe is sitting behind a raised counter, as if in a courtroom. In the foreground, a short-haired second man stands with hands behind him in handcuffs. A third man stands facing the second man. Third man: Defendant collected email addresses from AT&T's website, your honor. He deserves severe prison time. In the next panel, only the short-haired man in handcuffs and the third man are seen, in a slightly closer view. Short-haired man in handcuffs: But email addresses are just metadata! Where's the harm? In the third and final panel, only a close-up view of the third man is seen. His hands are on his waist. 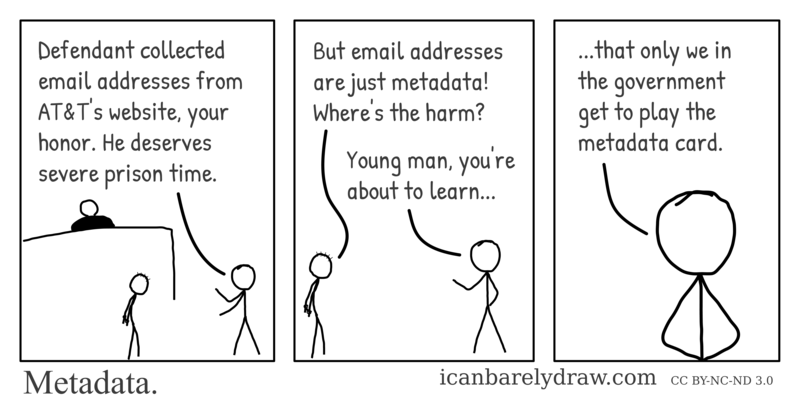 Third man: ...that only we in the government get to play the metadata card.